Samsung is still steering well clear of Android Wear at IFA 2017 with both of its new wearables. The larger of the two is the Samsung Gear Sport, a follow-up to last year's Gear S3. 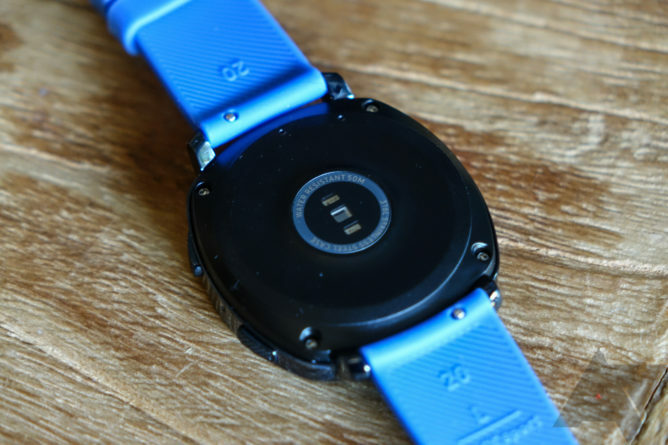 It's not intended to replace that watch, but it's a smaller and you might say more fun wearable with an assortment of band options and many of the features that have made Samsung's wearables notable. The most important thing here; the Gear Sport fits wonderfully, and that makes me happy. The Gear Sport is one of those smartwatches that could be confused with a real watch if you just glance at it. The providence of the Gear Sport is clear when you use it, though. 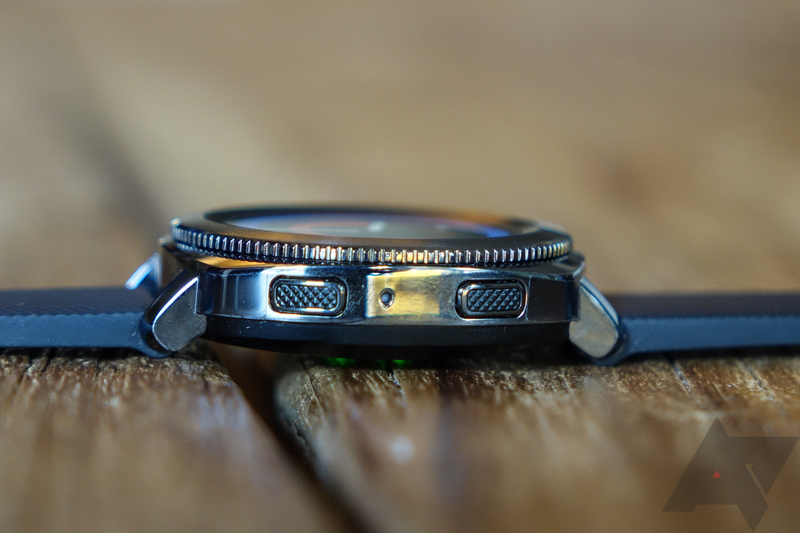 It has the same rotating bezel as the other Gear devices, and the software is pure Tizen. Samsung notes that consumers seem to prefer watches with cases around 42mm, so that's what the Samsung Gear Sport is—a mere 42.9mm across. It'll come in blue and black with a wide assortment of replaceable straps. 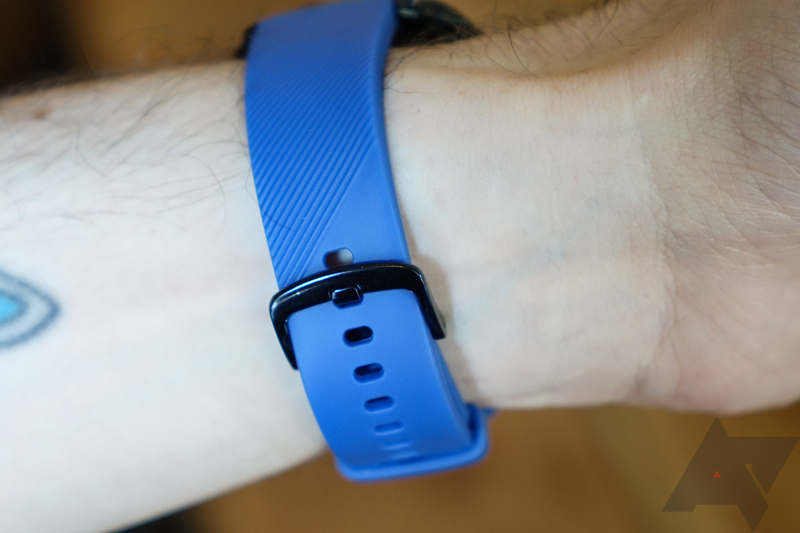 The blue rubber one I checked out seemed to be of good quality, but there will also be some interesting "hybrid" bands with a rubber base and leather top layer. So, it's good for working out and still looks snazzy. Don't like any of Samsung's bands? It's a standard 20mm lug connector. This watch fits very well, even if you've got smaller wrists like mine. The display is still a 1.2-inch AMOLED just like the Gear S3. So, how is it more compact than last year's watch? Most likely thanks to the modified implementation of Samsung Pay. This watch has support for NFC payments, but the hardware for Magnetic Secure Transmission (MST) is not included. Users will probably be split on this—if the Gear S3 fit you fine, you'd probably lament the loss of MST. However, if the Gear S3 was just a little too large, this might be a worthwhile trade-off. 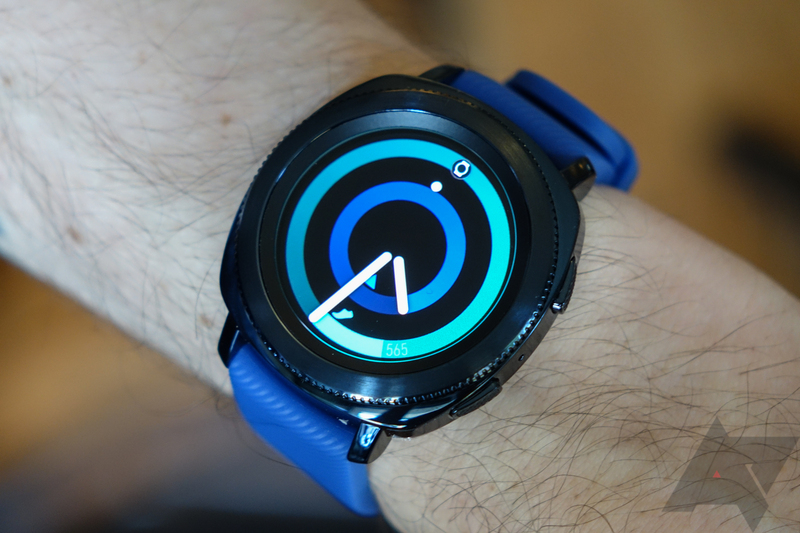 Samsung is emphasizing the health and fitness aspects of this watch. For example, you can track your calories by adding foods and factoring in calories burned based on the watch's continuous heart rate data. There's offline Spotify and Speedo swim tracker support, too. Some of these features are a bit tedious to use on such a small screen, but it's doable thanks to the rotating bezel—it's a great way to get around the UI. The watch is water-resistant to 50 meters (five atmospheres), so you can take it swimming no problem. It's also MIL-STD-810G certified for shocks and drops. It did feel like a solid little piece of technology. The 300mAh battery is allegedly enough to push the Gear Sport through four days of usage—I obviously can't comment on that based on my limited time with the watch. That claim probably assumes the watch's always-on display is disabled, which is the default setting on Samsung's smartwatches. Samsung doesn't have specific timing for the launch of this watch, nor a price point. You should be able to spend some amount of money on one this fall.